1977 Presidential Inauguration: MS Chief Justice WARREN BURGER administering Oath of Office to JIMMY CARTER, wife ROSALYN CARTER standing beside him, Jan 20, 1977. 1980 Democratic Convention. Jimmy Carter shaking hands with other officials. General shots of crowds cheering. Ted Kennedy on the podium with Jimmy Carter. 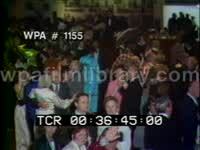 1976 Democratic National Convention: MSs Governor JIMMY CARTER & Senator WALTER MONDALE standing on podium, waving to crowd, wives Rosalyn Carter and June Mondale in tow; MSs Jimmy Carter lifting daughter Amy Lynn Carter. 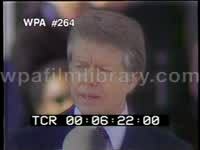 November 12th, 1979 The President, President JIMMY CARTER "... we refuse to permit the use of terrorism and the seizure and the holding of hostages to impose political demands. No one should underestimate the resolve of the American Government and the American people in this matter. It is necessary to eliminate any suggestion that economic pressures can weaken our stand on basic issues of principle. Our position must be clear. I am ordering that we discontinue purchasing of any oil from Iran for delivery to this country." 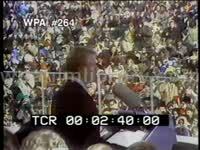 1976 Democratic National Convention: MCU Mr. Carter speaking at convention: "There's a new mood in America. We've been shaken by a tragic war abroad and by scandals and broken promises at home. Our people are searching for new voices and new ideas and new leaders.". MCU Jimmy Carter speaking on unemployment & inflation at outdoor rally: "We are not to be a welfare nation, we are to be a nation where people go to work, have a chance to work. Next January we are going to put our people back to work." TLS blue collar workers walking from parking lot to plant, lunchboxes in hand. TLSs of nuclear reactor being built. Aerial of crane in open mine pit. MS President Jimmy Carter delivering national address from Oval Office: "I want to have a frank talk with you tonight about a serious domestic problem: inflation." MSs diligent President Jimmy Carter in various meeting with aides & cabinet members, talking on phone, working in Oval Office. 1977 Presidential Inauguration: CU Mr. Carter delivering inaugural address: "Let us create together a new national spirit of unity & trust. Your strength can compensate for my weakness. Your wisdom can help to minimize my mistakes. Let us learn together, laugh together, work together, pray together, confident that in the end, we will triumph together in the right." TLS Carter family walking along Pennsylvania Ave, waving to crowd, Secret Service flanking them. 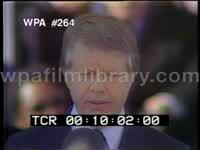 MS U.S. President Jimmy Carter delivering national televised address, 1980: "The erosion of our confidence in the future is threatening to destroy the social & political fabric of America." 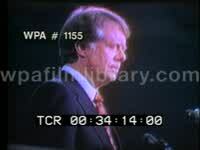 1980 State of the Union Address: h/a LS Joint Session of Congress standing, applauding; CU Jimmy Carter saying the Soviet Union must pay for their aggression. Panama Canal 1977: MSs U.S. President JIMMY CARTER & Panama President OMAR TORRIJOS signing the Panama Canal transfer treaties, hugging afterwards, Sept 7, 1977. MS President Jimmy Carter shaking hands w/ Leonid Brezhnev at the SALT II talks, Leonid kissing each cheek of Jimmy, June 18, 1979 (Vienna). Nice LS Capitol Dome, day, American flags flying from building in midground. MS several Muslim rebels standing & praying in bunker in Afghanistan, their assault rifles resting before them. 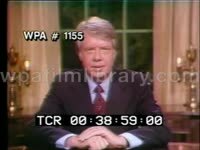 Dec 31, 1979 TV address: CU President Carter saying his opinion of the USSR has changed following the invasion of Afghanistan. 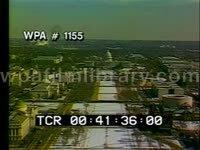 Scenic LS of Washington DC w/capitol building in BG. MS President Jimmy Carter signing legislation at White House, staff applauding as he sheaths pen, stands. TLS uniformed Soviet soldiers marching in tight formation. MS Soviet Secretary-General LEONID BREZHNEV & staff. High angle LS floor of House of Representatives during vote. Air to air shot of B-1 bomber in flight. Tilting LS MX Missile being fired. MSs President Carter speaking at naval commencement exercises at Annapolis, June 7, 1978: "Detente is essential to world peace." Nice LS Capitol Building at sunset, diss to interior floor of House of Representatives during vote. 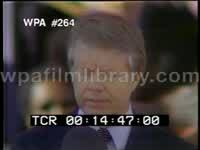 Jimmy Carter delivers national address regarding energy crisis & conservation, Apr 5, 1979: "Each of us will have to use less oil and pay more for it." Camp David Peace Accord, 1978: CU Prime Minister of Israel MENACHEM BEGIN; MSs Anwar Sadat, Menachem Begin and Jimmy Carter at table for signing of the peace accord, shaking hands; CU Begin speaking-- "No more war. No more bloodshed. No more bereavement. Peace onto you. Shalom, Salaam, forever." Jimmy Carter Within us, the people of the United States, there is evident a serious and purposeful rekindling of confidence. And I join in the hope that when my time as your President has ended, people might say this about our Nation: that we had remembered the words of Micah and renewed oursearch for humility, mercy, and justice; that we had torn down the barriers that separated those of different race and region and religion, and where there had been mistrust, built unity, with a respect for diversity; that we had found productive work for those able to perform it; that we had strengthened the American family, which is the basis of our society; that we had ensured respect for the law and equal treatment under the law, for the weak and the powerful, for the rich and the poor; and that we had enabled our people to be proud of their own Government once again. (applause) I would hope that the nations of the world might say that we had built a lasting peace, based not on weapons of war but on international policies which reflect our own most precious values. These are not just my goals, and they will not be my accomplishments, but the affirmation of our Nation's continuing moral strength and our belief in an undiminished, ever-expanding American dream. Thank you very much." Jimmy Carter "For myself and for our Nation, I want to thank my predecessor for all he has done to heal our land. 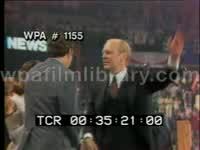 (appluase) (Mr. Gerald Ford stands, shakes hands with Mr. Carter, then waves to the crowd.) In this outward and physical ceremony, we attest once again to the inner and spiritual strength of our Nation. As my high school teacher, Miss Julia Coleman, used to say, We must adjust to changing times and still hold to unchanging principles. Here before me is the Bible used in the inauguration of our first President, in 1789, and I have just taken the oath of office on the Bible my mother gave me just a few years ago, opened to a timeless admonition from the ancient prophet Micah: 'He hath showed thee, O man, what is good; and what doth the Lord require of thee, but to do justly, and to love mercy, and to walk humbly with thy God. This inauguration ceremony marks a new beginning, a new dedication within our Government, and a new spirit among us all. A President may sense and proclaim that new spirit, but only a people can provide it. 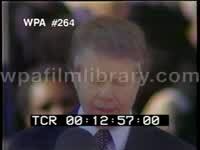 Jimmy Carter Two centuries ago, our Nation's birth was a milestone in the long quest for freedom. But the bold and brilliant dream which excited the founders of this Nation still awaits its consummation. I have no new dream to set forth today, but rather urge a fresh faith in the old dream. (MS of Rosalyn Carter.) Ours was the first society openly to define itself in terms of both spirituality and human liberty. It is that unique self-definition which has given us an exceptional appeal, but it also imposes on us a special obligation to take on those moral duties which, when assumed, seem invariably to be in our own best interests." Jimmy Carter "You have given me a great responsibility, to stay close to you, to be worthy of you, and to exemplify what you are. Let us create together a new national spirit of unity and trust. Your strength can compensate for my weakness, and your wisdom can help to minimize my mistakes. Let us learn together and laugh together and work together and pray together, confident that in the end we will triumph together in the right. (applause) The American dream endures. We must once again have full faith in our country, and in one another. I believe America can be better. We can be even stronger than before. Let our recent mistakes bring a resurgent commitment to the basic principles of our Nation, for we know that if we despise our own government, we have no future. We recall in special times when we have stood briefly, but magnificently, united. In those times no prize was beyond our grasp. But we cannot dwell upon remembered glory. We cannot afford to drift. We reject the prospect of failure or mediocrity or an inferior quality of life for any person. Our Government must at the same time be both competent and compassionate. 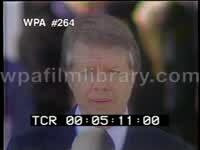 Jimmy Carter "Because we are free, we can never be indifferent to the fate of freedom elsewhere. (applause) Our moral sense dictates a clear-cut preference for those societies which share with us an abiding respect for individual human rights. We do not seek to intimidate, but it is clear that a world which others can dominate with impunity would be inhospitable to decency and a threat to the well-being of all people. The world is still engaged in a massive armaments race designed to ensure continuing equivalent strength among potential adversaries. We pledge perseverance and wisdom in our efforts to limit the world's armaments to those necessary for each nation's own domestic safety. And we will move this year a step toward our ultimate goal, the elimination of all nuclear weapons from this Earth. (applause) We urge all other people to join us, for success can mean life instead of death. Jimmy Carter "Our Nation can be strong abroad only if it is strong at home. And we know that the best way to enhance freedom in other lands is to demonstrate here that our democratic system is worthy of emulation. To be true to ourselves, we must be true to others. We will not behave in foreign places so as to violate our rules and standards here at home, for we know that the trust which our Nation earns is essential to our strength. The world itself is now dominated by a new spirit. Peoples more numerous and more politically aware are craving, and now demanding, their place in the sun, not just for the benefit of their own physical condition, but for basic human rights. The passion for freedom is on the rise. Tapping this new spirit, there can be no nobler nor more ambitious task for America to undertake on this day of a new beginning than to help shape a just and peaceful world that is truly humane. (MS of the Joint Chiefs of Staff.) We are a strong nation, and we will maintain strength so sufficient that it need not be proven in combat, (applause) a quiet strength based not merely on the size of an arsenal but on the nobility of ideas. We will be ever vigilant and never vulnerable, and we will fight our wars against poverty, ignorance, and injustice, (applause) for those are the enemies against which our forces can be honorably marshaled. We are a proudly idealistic nation, but let no one confuse our idealism with weakness." Jimmy Carter "We have already found a high degree of personal liberty, and we are now struggling to enhance equality of opportunity. Our commitment to human rights must be absolute, our laws fair, our national beauty preserved; the powerful must not persecute the weak, and human dignity must be enhanced. We have learned that more is not necessarily better, that even our great Nation has its recognized limits, and that we can neither answer all questions nor solve all problems. We cannot afford to do everything, nor can we afford to lack boldness as we meet the future. So, together, in a spirit of individual sacrifice for the common good, we must simply do our best." President Carter continues: "The American people want the actions of their government, our government, both to reduce human suffering and to increase human freedom. That's why, with the help and encouragement of many of you in this room, I have sought to rekindle the beacon of human rights in American foreign policy. Over the last 2 years we've tried to express these human concerns as our diplomats practice their craft and as our Nation fulfills its own international obligations. We will speak out when individual rights are violated in other lands. The Universal Declaration means that no nation can draw the cloak of sovereignty over torture, disappearances, officially sanctioned bigotry, or the destruction of freedom within its own borders. The message that is being delivered by all our representatives abroad, whether they are from the Department of State or Commerce or Agriculture or Defense or whatever, is that the policies regarding human rights count very much in the character of our own relations with other individual countries. In distributing the scarce resources of our foreign assistance programs, we will demonstrate that our deepest affinities are with nations which commit themselves to a democratic path to development. Toward regimes which persist in wholesale violations of human rights, we will not hesitate to convey our outrage, nor will we pretend that our relations are unaffected." MS President JIMMY CARTER entering press conference. He takes podium, gives speech. "What I have to say today is fundamentally very simple. It's something I've said many times, including my acceptance speech when I was nominated as President and my inaugural speech when I became President. But it cannot be said too often or too firmly nor too strongly. As long as I am President, the Government of the United States will continue throughout the world to enhance human rights. (appluase) No force on Earth can separate us from that commitment. This week we commemorate the 30th anniversary of the Universal Declaration of Human Rights. We rededicate ourselves, in the words of Eleanor Roosevelt, who was the chairperson of the Human Rights Commission, to the Universal Declaration as, and I quote from her, a common standard of achievement for all peoples of all nations. The Universal Declaration and the human rights conventions that derive from it do not describe the world as it is. But these documents are very important, nonetheless. They are a beacon, a guide to a future of personal security, political freedom, and social justice." President Carter continues: "Next week marks another human rights anniversary, Bill of Rights Day. Our Nation was conceived in liberty, in Lincoln's words, but it has taken nearly two centuries for that liberty to approach maturity. For most of the first half of our history, black Americans were denied even the most basic human rights. For most of the first two-thirds of our history, women were excluded from the political process. Their rights and those of Native Americans are still not constitutionally guaranteed and enforced. Even freedom of speech has been threatened periodically throughout our history. Only in the last 10 to 12 years have we achieved what Father Hesburgh has called the legal abandonment of more than three centuries of apartheid. And the struggle for full human rights for all Americans, black, brown, and white; male and female; rich and poor, is far from over. To me, as to many of you, these are not abstract matters or ideas. In the rural Georgia country where I grew up, the majority of my own fellow citizens were denied many basic rights, the right to vote, the right to speak freely without fear, the right to equal treatment under the law. I saw at first hand the effects of a system of deprivation of rights. I saw the courage of those who resisted that system. And finally, I saw the cleansing energies that were released when my own region of this country walked out of darkness and into what Hubert Humphrey, in the year of the adoption of the Universal Declaration, called the bright sunshine of human rights. The American Bill of Rights is 187 years old, and the struggle to make it a reality has occupied every one of those 187 years. The Universal Declaration of Human Rights is only 30 years old. In the perspective of history, the idea of human rights has only just been broached. I do not draw this comparison because I want to counsel patience. I draw it because I want to emphasize, in spite of difficulties, steadfastness and commitment." President Carter continues: "A hundred and eighty-seven years ago, as far as most Americans were concerned, the Bill of Rights was a bill of promises. There was no guarantee that those promises would ever be fulfilled. We did not realize those promises by waiting for history to take its inevitable course. We realized them because we struggled. We realized them because many sacrificed. We realized them because we persevered. For millions of people around the world today the Universal Declaration of Human Rights is still only a declaration of hope. Like all of you, I want that hope to be fulfilled. The struggle to fulfill it will last longer than the lifetimes of any of us. Indeed, it will last as long as the lifetime of humanity itself. But we must persevere. And we must persevere by ensuring that this country of ours, leader in the world, which we love so much, is always in the forefront of those who are struggling for that great hope, the great dream of universal human rights. Thank you very much." President Carter steps from riser, shakes the hands of those in the front row, and exits. President Carter continues: "For millions of people around the globe that beacon is still quite distant, a glimmer of light on a dark horizon of deprivation and repression. The reports of Amnesty International, the International Commission of Jurists, the International League for Human Rights, and many other nongovernmental human rights organizations amply document the practices and conditions that destroy the lives and the spirit of countless human beings. Political killings, tortures, arbitrary and prolonged detention without trial or without a charge, these are the cruelest and the ugliest of human rights violations. Of all human rights, the most basic is to be free of arbitrary violence, whether that violence comes from government, from terrorists, from criminals, or from self-appointed messiahs operating under the cover of politics or religion. But governments, because of their power, which is so much greater than that of an individual, have a special responsibility. The first duty of a government is to protect its own citizens, and when government itself becomes the perpetrator of arbitrary violence against its citizens, it undermines its own legitimacy. There are other violations of the body and the spirit which are especially destructive of human life. Hunger, disease, poverty are enemies of human potential which are as relentless as any repressive government." President Carter continues: "In the coming year, I hope that Congress will take a step that has been long overdue for a generation, the ratification of the Convention on the Prevention and Punishment of the Crime of Genocide. (appluase) As you know, the genocide convention was also adopted by the United Nations General Assembly 30 years ago this week, 1 day before the adoption of the Universal Declaration. It was the world's affirmation that the lesson of the Holocaust would never be forgotten, but unhappily, genocide is not peculiar to any one historical era. Eighty-three other nations have ratified the genocide convention. The United States, despite the support of every President since 1948, has not. In international meetings at the United Nations and elsewhere, when I meet with foreign leaders, we are often asked why. We do not have an acceptable answer. I urge the United States Senate to observe this anniversary in the only appropriate way, by ratifying the genocide convention at the earliest possible date. This action must be the first step toward the ratification of other human rights instruments, including those I signed a year ago. Many of the religious and human rights groups represented here have undertaken a campaign of public education on behalf of these covenants. I commend and appreciate your efforts." President Carter continues: "Often, a choice that moves us toward one goal tends to move us further away from another goal. Seldom do circumstances permit me or you to take actions that are wholly satisfactory to everyone. But I want to stress again that human rights are not peripheral to the foreign policy of the United States. Our human rights policy is not a decoration. It is not something we've adopted to polish up our image abroad or to put a fresh coat of moral paint on the discredited policies of the past. Our pursuit of human rights is part of a broad effort to use our great power and our tremendous influence in the service of creating a better world, a world in which human beings can live in peace, in freedom, and with their basic needs adequately met. Human rights is the soul of our foreign policy. (appluase) And I say this with assurance, because human rights is the soul of our sense of nationhood. For the most part, other nations are held together by common racial or ethnic ancestry, or by a common creed or religion, or by ancient attachments to the land that go back for centuries of time. Some nations are held together by the forces, implied forces of a tyrannical government. We are different from all of those, and I believe that we in our country are more fortunate. As a people we come from every country and every corner of the Earth. We are of many religions and many creeds. We are of every race, every color, every ethnic and cultural background. We are right to be proud of these things and of the richness that lend to the texture of our national life. But they are not the things which unite us as a single people. What unites us, what makes us Americans, is a common belief in peace, in a free society, and a common devotion to the liberties enshrined in our Constitution. That belief and that devotion are the sources of our sense of national community. Uniquely, ours is a nation founded on an idea of human rights. From our own history we know how powerful that idea can be." 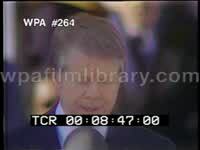 MS President JIMMY CARTER and First Lady ROSALYN CARTER walking from White House and to podium. MSs Vice President WALTER MONDALE speaking at podium. Walter Mondale: "Mr. President, Rosalynn, and friends: You leave tonight, Mr. President, on perhaps the most important and difficult mission of your Presidency. You seek a peace vital not only to the people of the Middle East but to the people of our own Nation and to all mankind. There is no challenge more urgent than seeking that peace, for as the Bible tells us, it is the peacemakers who are blessed. And you, Mr. President, Prime Minister Begin, and President Sadat are three such peacemakers. Your efforts are even more than a pivotal moment in the history of the Middle East, for as a poet once put it, Peace hath her victories no less renowned than war. Each generation bears two fundamental responsibilities to the next: One is to lay down our lives, if need be, for the things that we treasure; the other is to work ceaselessly so that our children will not be asked to make that sacrifice. Both duties are sacred. Both require courage. Both are filled with grave risks. There are statesmen whose tasks it is to go to the brink of war. For others, their courage is tested by the challenge to go to the brink for peace. In the end, the truest measure of our humanity is how we rise to the second challenge. Mr. President, tonight, as 6 months ago, you meet that demanding measure. Please know that you have our love, our prayers. The prayers of all humanity are with you this evening as you search for that nobler victory, the victory of peace. " Walter Mondale & Jimmy Carter shake hands. DO NOT USE audio commentary. TLS/MS group of Democratic & Republican Congressmen standing by podium on South Lawn of White House. MS President JIMMY CARTER and First Lady ROSALYN CARTER walking from White House and to podium. President JIMMY CARTER assumes the podium on the South Lawn of White House. ROSALYN CARTER and WALTER MONDALE standing behind him. President Jimmy Carter: "Nothing could give me more encouragement and a more gratifying sense than to have surround me here not only the Vice President but the distinguished Members of Congress. I leave tonight on a new mission in the service of the oldest of human dreams, the dream of peace. And nowhere is this hope for peace more fervent, more alive than in the Middle East; nowhere is the path to its realization more difficult; nowhere might the price of failure be more terrible. Peace remains the goal of President Sadat and Prime Minister Begin and of the great peoples of Egypt and of Israel. I know that they share my determination that these long negotiations will bring fruit. The Middle East has suffered too much and too long from war and from the fear of war. Arabs and Israelis alike must now understand that bloodshed and deprivation and death can never settle their differences, can never be the path toward renewal and hope. For the first time in a generation, peace in the Middle East has come within reach. President Sadat's visit to Jerusalem, his great and courageous reception by Prime Minister Begin, the reciprocal visit by the Prime Minister to Egypt, all opened the way toward possible progress. At Camp David, we then worked together for 13 days to forge a political framework within which their differences might be resolved. Our negotiations have been and are based on the idea that peace can only be achieved when we meet the legitimate needs of all those who are affected by the conflict. Real peace will not come with a single treaty, important as it would be. But a treaty between Egypt and Israel is an indispensable step toward the broader comprehensive peace that we all seek. Negotiation is a long and tedious process, I know from personal experience. But there are times when making peace demands more courage than making war. I believe that President Sadat and Prime Minister Begin possess that special kind of courage and that they possess, as well, the vision and the statesmanship to redeem the great hope which they themselves have helped to create. So, it is with hope that I depart, hope tempered by sober realism. As a friend of Egypt and a friend of Israel, we will do our best to help them achieve the peace that they have paid for in blood many times over. In doing this, in seeking to lay the basis for a stable and a peaceful Middle East, we will also be serving our own deepest national interests and the interests of all the people of the world. I know that in this endeavor, I take with me the prayers and the good wishes of the American people. In the difficult work that lies ahead, I will draw strength and sustenance from those worldwide prayers and from your support. Thank you very much. Goodbye, everybody, I'm on my way." ENERGY PROGRAM Walt Rodgers: Mr. President, we've been told that the central thrust of your new energy program will involve sacrifice and voluntary conservation. Yet the public is always reading stories in the paper of how the major oil companies are withholding natural gas. I'd like to ask how are you going to expect the public to make sacrifices when there is such widespread public suspicion about the role of the oil companies in the energy crisis? 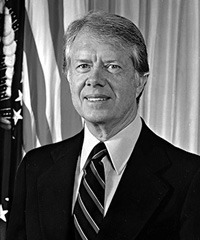 Carter: I think the comprehensive nature of the proposal, the fact it takes in all these very disparate and sometimes conflicting elements at one time, and a long-range projection of our needs in a tangible demonstration to the American people to the extent that I am able to put it forward, that there will be direct ultimate benefits to them, will be the elements that will cause them to make those sacrifices. At the same time, I want to increase the surety that we have that the reserve supply data given to us by the oil companies and others are accurate. We are now conducting some admittedly superficial studies by Secretary Cecil Andros in Interior, and also they will be followed up by more detailed studies under Dr. Schlesinger, to see whether or not the reserve supplies are adequate and whether or not the oil companies are giving us accurate data. I think it's obvious to all of us that there are some instances where natural gas is withheld from the market. That's understandable. If I was running an oil company, I would reserve the right to release or to reserve some supplies of natural gas. With the emergency legislation that the Congress did pass, I think in about a week of assessment during the frigid part of the winter it's still very cold, we were given some authority to buy extra gas at a very high price. This is obviously a transient circumstance. But I believe the American people will be willing to make the sacrifices required if they are convinced that future reports will be accurate, that supplies will not be withheld from the market. And if we can let the oil companies know in a predictable way what our policy will be 2 months or 2 years or 20 years in the future, within the bounds of human reason, then I think they will be much less likely to withhold supplies of oil and natural gas from the market just hoping that they will get some bonanza or increased price in the future if the policies do change. Press: Mr. President, another question, sir, on the sacrifices that you say your upcoming energy program is going to demand. Is it likely that one of those sacrifices is going to come in the form of a largely increased Federal gasoline tax? Carter: I don't know how to answer your questions about specifics of the proposal. I want to make this clear: The purpose of the energy policy evolution is not to cause sacrifice or hardship among the American people. Unless I can demonstrate that in balance the temporary sacrifices in a certain area are far overcome by immediate and ultimate benefits, then nobody is going to buy it. And I believe that we've now got such a horrible conglomeration of confusion in the energy field that nobody knows what is going to happen next. So, I think that the sacrifices will be far overcome by the benefits that the American people will be easily able to discern for themselves. MS President JIMMY CARTER entering east wing press room to make a brief statement. Jimmy Carter: Good afternoon, everybody. I would like to make a very brief statement as a progress report to the American people on some items that are important to us. We have submitted and the Congress is now considering legislation to give me the authority to reorganize the executive branch of government. The Senate committee under Senator Ribicoff has now completed their hearings and they will be marking up the bill beginning tomorrow. The House Committee on Government Operations, under Congressman Jack Brooks, has scheduled hearings to begin on March 1. So, because of the interest of the American people and the Congress and myself in completing this very crucial project, I think the Congress is moving with great expedition to give me that authority. We've also initiated with directions to the members of the Cabinet and other agency heads a new program to cut down on the extremely great overload of paperwork with a requirement that those who prepare Government regulations, who are responsible for the preparation, sign them. I've asked my Cabinet officers to read the regulations that are forthcoming from their departments each week until they see the volume and the complexity of them. And we hope to eliminate unnecessary regulations, abbreviate those that are necessary and express them in a language so that we can all understand them. I've also asked major elements of our society, the university professors and the State officials, in this last week to give me their suggestions on how the regulations might be improved. We've done the same thing with reports required by the Federal Government. And I hope to reduce drastically the number of reports, the frequency of those reports and the complexity of them. We will complete the proposed legislation on creating a new Department of Energy this week. The proposed legislation is now on my desk. It will be submitted to the Congress for action the first of next week. And we've consulted very closely with the key leaders in the Congress. And I believe there is going to be a rapid creation of this new department and a heavy emphasis on the importance of energy questions to our people. We will also present to the American people, probably at a joint session of the Congress speech by me, about April the 20th, a comprehensive energy policy which will involve all the complexities of the energy question, that's something that's long overdue, and it's going to be quite profound on its impact on the American consciousness and our society. And I hope it will be comprehensive enough so that it can be well-balanced and fair to all. We are quite concerned about the pressures of inflation. The advisers to me on economics are trying to assess all Government programs and private actions that contribute to inflationary pressures. When this analysis is done, I will use every means that I have available to me to express these concerns and possibly corrective actions to the American people as well. And the last point is that we will have a complete analysis underway now on deregulation. And the first question is the deregulation of the airlines. Legislation is in the Congress now. We will be submitting a message to Congress very shortly on that subject. We will not submit administration legislation because the Congress has already moved substantially forward in dealing with this important issue. CIA ACTIVITIES Helen Thomas: Mr. President, do you think it was proper for the CIA to pay off King Hussein and other foreign leaders, and what steps are you taking to make yourself more knowledgeable and more accountable for what CIA does? Carter: Well, I've adopted a policy, which I am not going to leave, of not commenting directly on any specific CIA activity. But I can tell you that I have begun a complete analysis, which will be completed within the next week, of all activities by the CIA. I've received substantial reports already. I've reviewed the more controversial revelations that have been publicized in the last few days, some quite erroneous, some with some degree of accuracy. These same operations have been reviewed by the Intelligence Oversight Board, an independent board, and also by my predecessor, President Ford. I have not found anything illegal or improper. If in future assessments, which will come quite early, I discover such an impropriety or an illegality, I will not only take immediate action to correct it but also will let the American people know about it. I might say this: This is a very serious problem of how in a democracy to have adequate intelligence gathered, assessed, and used to guarantee the security of our country. It's not part of the American nature to do things in secret. Obviously, historically and still at this modern time, there is a necessity to protect sources of information from other nations. Sometimes other governments cooperate with us fully; sometimes they don't. But I will try to be sure and so will Stan Turner, who will be the next director of the intelligence community. He will try to be sure that everything we do is not only proper and legal but also compatible with the attitudes of the American people. One other point I'd like to make is this: It can be extremely damaging to our relationship with other nations, to the potential security of our country even in peacetime, for these kinds of operations, which are legitimate and proper, to be revealed. It makes it hard for us to lay a groundwork on which we might predicate a successful meeting of a threat to us in time of war if we don't have some degree of secrecy. I am quite concerned about the number of people now who have access to this kind of information. And I've been working very closely with the congressional leaders, yesterday and today, to try to reduce the overall number of people who flare access to the sources of information. But within the bounds that I've described, propriety, legality, and the American attitude towards secrecy, I will do the best I can not ever to make a mistake. And I am also assuming on a continuing basis a direct personal responsibility for the operation of all the intelligence agencies in our Government to make sure that they are meeting these standards. Helen Thomas: Mr. President, if there has been erroneous information, wouldn't it behoove you to correct the record? 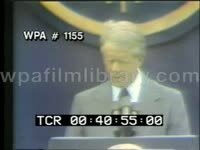 Carter: In some ways we are correcting the record, but if I began to either dispute or confirm every individual story that's written, whether correct or erroneous, on every matter relating to the CIA, then these matters which are necessarily secret would no longer be secret. So, I am not going to comment on individual items that relate to intelligence. HUMAN RIGHTS Press: In your letter to Mr. Sakharov, you said that the United States would use its good offices to seek the release of prisoners of conscience. And you said that you wanted to continue to shape a world responsible to human aspirations. As you know, there are human rights problems in many other countries. And some of them, like Iran or the Philippines, we support with arms or we support with American aid. These are countries where many people believe we have more leverage than we might have in the Soviet Union. What, if anything, do you plan to try to do to help victims of political repression in these countries? Carter: I think, without my trying to take credit for it, there has been a substantial move toward concern about human rights throughout the world. I think this has taken place in probably a dozen or more different countries. There is an arousing interest in the position that our own Government here and our free country does take. Obviously, there are deprivations of human rights, even more brutal than the ones on which we've commented up till now. In Uganda, the actions there have disgusted the entire civilized world, and as you know, we have no diplomatic relationships with Uganda. (The White House Press Office later issued a correction which stated: While the United States has withdrawn its mission from Uganda and has no direct diplomatic representation there, U.S. affairs in the Republic of Uganda are carried out through the West German Embassy, and the Republic of Uganda has an operating embassy and charge d'affaires in Washington.) But here is an instance where both Ambassador Andrew Young and I have expressed great concern about what is there. The British are now considering asking the United Nations to go into Uganda to assess the horrible murders that apparently are taking place in that country, the persecution of those who have aroused the ire of Mr. Amin. I've expressed my concern about imprisoned political prisoners in South Korea, in Cuba, in many countries in several countries rather in South America, and I will continue to do so. I have never had an inclination to single out the Soviet Union as the only place where human rights are being abridged. We have, I think, a responsibility and a legal right to express our disapproval of violations of human rights. The Helsinki agreement, the so-called basket 3 provision, ensures that some of these human rights shall be preserved. We are a signatory of the Helsinki agreement. We are, ourselves, culpable in some ways for not giving people adequate right to move around our country, or restricting unnecessarily, in my opinion, visitation to this country by those who disagree with us politically. So, I think that we all ought to take a position in our country and among our friends and allies, among our potential adversaries, that human rights is something on which we should bear a major responsibility for leadership. And I have made it clear to the Soviet Union and to others in the Eastern European Community that I am not trying to launch a unilateral criticism of them; that I am trying to set a standard in our own country and make my concerns expressed throughout the world, not singled out against any particular country. RELATIONS WITH CONGRESS Press: Mr. President, Charles Kirbo, your friend, Charles Kirbo, seems to feel that you are going to be having a continuing problem with the Congress and that you will have to go over Congress head to the people in order to get results. Is this true? Carter: I think if you read the whole statement that Mr. Kirbo made, which is just a private citizen's opinion, he would say that every President has had arguments and debates and disagreements with the Congress. And I think that's inevitable in our system of government. That's part of the checks and balances that's very precious to us all. I have found up till now a growing sense of cooperation with the Congress. I think last week when I was asked roughly the same question, that the troubles were perhaps underestimated by the news media. I think now perhaps the troubles with the Congress are overestimated. I have frequent meetings with the congressional leaders, both Democratic and Republican. And I think that the progress of the legislation that we consider to be crucial, which seemed to be moving very slowly in the past, is now speeding up. So, I don't believe that we will have nearly the problems with the Congress that has been the case in recent years. And I have to say in summary that I am very pleased with my relationship with the Congress now. ELECTION REFORM Press: Mr. President, in view of your assignment to Vice President Mondale regarding the election laws, could you give us your views, sir, on the direct election of a President versus the electoral college, and also, do you think that the public financing should be extended to Congress as well as the Presidency? Carter: There are three basic questions that come up. In the first place, I do favor at least an automatic vote by Presidential electors, once the general election is completed. I think the electoral college, for instance, should be eliminated. Whether the ratio among States of votes ought to be changed, I am not prepared to comment on that. As far as the financing of congressional elections by public funds, as proved to be successful, I believe, in the Presidential election, I strongly favor that, yes. And the other element of the overall package would be a simple way for American people who are citizens and 18 years old to register to vote. And I am committed to that proposition, and the Vice President has graciously consented to take on this overall election process responsibility. Those three will be basic elements of the proposals. DEFENSE EXPENDITURES Press: In answer to an earlier question, Mr. President, you said that you couldn't say whether next year's defense budget would be lower or higher than this year's. But as I understood your earlier position, you did want to achieve a $5 to $7 billion savings, regardless of the overall level of spending. Do you still hold with that figure? Is that still your goal and a commitment? Carter: Yes. The analysis that I've made of the defense budget so far, which as you know has been limited to about a month's study, just part-time, indicate that that's a goal that will be reached. NATURAL GAS DEREGULATION Press: Mr. President, in letters to the Governors of Oklahoma, Texas, and Louisiana last October, you said unconditionally that you would work with Congress to deregulate new natural gas. And I wondered if you planned to keep that promise, and if so, how will you go about it? Carter: I don't know how I will go about it. I do plan to keep my promises. The position that I have taken and the position that the Governors of Oklahoma and Texas took at Governors' conferences to which I was referring, was the deregulation of natural gas for a limited period of time, 4 to 5 years, to see how it works out, leaving existing contracts in effect. But I will work with Congress on the deregulation of natural gas as a part of an overall energy policy. By April 20, I think we will be prepared to present to you, the news media, the people, and the Congress, more specific proposals involving direct legislative proposals that will answer your question more fully. CAMPAIGN PROMISES Ann Compton, ABC News: Mr. President, you've had a month now to enjoy the view from the Oval Office. Do you think you will be able to keep fully all the campaign promises you made? Carter: As you know, we have issued what I believe is a complete book of my campaign promises which is, I presume, being made available to all of you. My determination is to keep all those promises. Obviously, if circumstances should change, I would have to reserve the right to go back to the American people and say now that circumstances have changed, this is a better approach to that particular problem. But I will do my utmost to keep all the campaign promises that I made to the American people. ELECTION REFORM Fred Barnes: Mr. President, I was a little unclear about what you are going to propose in the campaign finance law. Are you saying that you will propose to have all congressional elections publicly financed? Carter: That's my preference, yes. Fred Barnes: Mr. President, is that what you have proposed to Congress? Carter: The Vice President is now doing a study on a complete election law package, and I'd like to reserve my own judgment until I see what his report is to me. But that's my own inclination. It's the position that I took during the campaign. And so far I have no reason to change my mind. DO NOT USE News Audio Commentary. Mr. Carter concludes the press conference by stepping from the podium to shake hands with the reporters. DEFENSE EXPENDITURES Mr. Frank Cormier, Associated Press: Mr. President, you told the Democratic Platform Committee that you thought present defense expenditures could be reduced by 5-to-7 billion dollars. I think you may have modified your position somewhat since then. Obviously, in your short time in office you didn't find the opportunity to make cuts like that in your predecessor's budget. But isn't it also likely that next year's budget for defense will exceed this year's? Carter: Well, because of inflationary pressures and because of an impossibility of assessing the potential threat to our country from other nations, it's hard to predict exactly what the level of defense spending will be. In the short time that we had available to work on the previous administration's budget, about 3 weeks of hard work, we were able to reduce the suggested expenditures by almost $3 billion, I think about $2.75 billion. This was done, and I think Senator Stennis in his-recent public statements has confirmed that it has been done without weakening our own defense capability. The substantial savings in defense spending that will still leave us a muscle will be in such things as the sanitization of weapons, long-range planning, a more business-like allocation of defense contracting, an assessment of the defense contracts for construction and repair already outstanding, a reassessment of priorities of the evolution of new weapons which in the future can become enormously expensive, a longer assignment of military personnel to a base before they are transferred, some emphasis on the correction of inequities and unfairness in the retirement system. These things obviously can't be done in 3 weeks, but they will be an ongoing effort on my part. And I think the 1979 budget, which will be my administration's first budget, will show these improvements to a substantial degree, Mr. Cormier. Mr. Frank Cormier, Associated Press: Will next year's defense budget actually be lower than the one that you just revised? Carter: I can't say yet. WAGE AND PRICE INCREASES Sam Donaldson: Mr. President, George Meany (President of the AFL-CIO) says he won't go along with your idea of prenotification on wage and price increases. My question really is, how hard are you going to press Mr. Meany to go along, and do you have anything else in mind that you could use in the way of government involving itself to try to control inflation? Carter: Well, I've announced earlier my firm commitment not to have mandatory wage and price laws or authority, not to have standby wage and price authority. I've not made any proposal to Mr. Meany or any other labor leader nor to any representative of industry or manufacturing. But I will retain the option in the future of assessing what we need to do to control inflation. I've emphasized always the word "voluntary," and to the extent that I can arrive at a common understanding with industry and labor leaders, that a certain amount of cooperation and information can be exchanged before a major proposal is made, I think that's a legitimate pursuit of mine. I can't force it. It's got to be voluntary. And that's as far as I can go with my answer. Sam Donaldson: Mr. President, a question directly about the wage and price guidelines, which might be voluntary. How is that for an idea? Carter: Well, I think rigid guidelines are a mistake. If we said that, for instance, that no price increase or no wage increase could exceed 6 percent, this would be too restrictive. It would be contrary to my own philosophy of government. And I think that, because of the diversity of our society, and the fact that it is a free enterprise system, we've got to have some flexibility. But I'd prefer to deal with these problems that arise on increasing prices on an individual basis. And I also prefer, of course, to work harmoniously with labor and management. But whether I will be successful, I don't know. I am just going to have to do my best. CIA DISCLOSURES Bob Schieffer: Mr. President, the other day, getting back to the Hussein thing, when that story broke, your Press Secretary, when he issued what amounted to a no comment by the White House, someone asked him if this story had broken back during the campaign when you were running for President would you have given a similar response. And he said, "Well, I don't know." So, can I ask you, what would have been your response? Would it have been the same? Carter: I don't know. [Laughter] Press: Mr. President, on the same subject, you said earlier that your review of CIA activities had found nothing illegal or improper, and you later said that these activities are legitimate and proper. Isn't that a value judgment that the American public might like to share, but how can they if you refuse to give them any idea of what you have discovered during this review about payments, including ones made in secret. Carter: That is a value judgment. It's made by the independent Intelligence Oversight Board which was established and appointed by President Ford. This Board has made itself available to the Inspector General and to any employee within the CIA or within the defense intelligence agencies or any other to receive even rumors of impropriety. They have assessed these operations. They made their inquiries in the past, which is in accordance with the Executive order issued by President Ford, to the Attorney General of the United States, and also to the President. I have read that correspondence. It's quite voluminous. And I think that it's accurate to say that Senator Inouye's committee in the Senate and the appropriate committees in the House have also received this information in the past. I have talked to Senator Inouye and he confirms what I've just told you. And I think he would also confirm that the impropriety or the illegality does not exist on any ongoing CIA operation. RELATIONS WITH CUBA Press: Mr. President, are you prepared to Jilt the trade embargo against Cuba as one step toward normalizing relations? 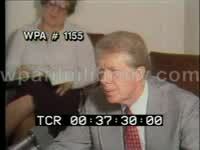 Carter: I think any substantial moves in our relationship with Cuba would have to await further discussions with them indirectly and also some tangible evidence on our part that they are willing to restore basic human rights in Cuba involving the number of prisoners who are being held, their attitude toward overseas adventures, such as the one in Angola, and other matters. So, I can't say what might come in the future. I am willing, though, to discuss these matters with the Cuban leaders. At this time we have no direct relationships with them politically, but through intermediaries, comments are being exchanged back and forth; most of my comments in public statements like this. But we do have messages coming back from people who visit Cuba. RELATIONS WITH CANADA Press: Mr. President, you said that in spite of the fact that the Canadian people would have to determine their future for themselves, particularly in regard to the separatism issue in Quebec, that you had confidence that the issue would be straightened out relatively peacefully. Do you really think that there is little concern in this country about the future of a unified Canada, and is there anything really that we can do about it? Carter: There is a great deal of concern in this country about the future of Canada. And I have complete confidence, as I said in an interview with the Canadian news media, in the sound judgment of the Canadian people. I am familiar, and even more familiar today than I was 2 days ago, after Prime Minister Trudeau's visit, with the problems in Quebec and the inclination of some of the French-Canadians to have an independent status from the rest of the Canadian provinces. I don't know what is going to be the ultimate outcome, but I believe that we are so closely tied together with Canada on a mutually beneficial basis, sharing problems, sharing opportunities, sharing trade, sharing manufacturing companies that have joint ownership, our exchange of energy sources, our sharing of the St. Lawrence Seaway, the Great Lakes, as far as water pollution is concerned, the bringing of Alaskan oil and natural gas down to us, that we have got to have a continuing relationship with Canada. My own personal preference would be that the commonwealth stay as it is and that there not be a separate Quebec province. But that's a decision for the Canadians to make. And I would certainly make no private or public move to try to determine the outcome of that great debate. FOREIGN POLICY Press: Mr. President, you gave us kind of a timetable for your domestic program in your preliminary statement. I wonder if you have a similar timetable of what you hope to achieve in foreign policy between now and the end of the year, such as in Middle East peace, Cyprus, the treaty with Panama? Carter: Of course I can't answer that question specifically because I don't know what cooperation we will get from other nations, and I don't know what the inclination of those nations in disputed regions of the world want to do toward one another. Secretary Cyrus Vance has just returned from what I consider to be a very successful trip to the Middle East. He not only probed with the heads of those governments and their cabinet members their own positions both public and private on the controversial issues that have so far prevented a peace in the Middle East. He also had a chance to compare their positions on issues, which ones they found to be in harmony, which ones there was still a dispute. We also invited the leaders of all those nations to meet with me. They have all accepted, and I will be meeting with the heads of the nations in dispute in the Middle East, all of them, before the end of May. The first visit of one of those leaders will be Mr. Rabin, I believe, March 12 (7 and 8 - White House Press Office clarification.). And he will be followed by the leaders from Egypt, from Jordan, and from Syria, from Saudi Arabia. And I look forward to meeting with them. At that point I hope I will have a very clear picture of what role the American Government ought to play. The same thing applies to the situation that exists between ourselves and Turkey, ourselves and Greece, ourselves and Cyprus. We can't impose our will on other people, but if they honestly want to seek a solution, we are perfectly willing to offer our good offices as a country with influence and interest to help them resolve their own differences. But it's got to be done primarily by those countries involved. We have begun again, within the last week, our discussions on the Panama Canal treaty. We have two extremely good negotiators, and I hope that we will have success there. There is no way that I can say at this point what degree of progress we have made. It's just beginning. So, throughout the areas of high dispute, including South Africa and others that I don't have time to mention, we are probing as best we can to discern some possibility of resolution of those tension areas. We are meeting today, in fact all this week, with the British, to try to get a renewed proposal to make concerning the questions surrounding Rhodesia, and then, of course, we will still have left Namibia and ultimately the majority rule question in South Africa. But I've only been in office a month. I don't claim to know all the easy answers. And these questions that have been in existence for 25 or 30 years are not going to be easy to solve. But we are going to do the best we can, openly and forcefully, offering our good services, not trying to impose our will on other people. Mr. Frank Cormier, Associated Press: Thank you, Mr. President. Carter: Thank you, Mr. Cormier. Jimmy Carter: "Looking for a way out of this crisis, our people have turned to the Federal Government and found it isolated from the mainstream of our Nation's life. Washington, D.C., has become an island. The gap between our citizens and our Government has never been so wide. The people are looking for honest answers, not easy answers; clear leadership, not false claims and evasiveness and politics as usual. What you see too often in Washington and elsewhere around the country is a system of government that seems incapable of action. You see a Congress twisted and pulled in every direction by hundreds of well-financed and powerful special interests. You see every extreme position defended to the last vote, almost to the last breath by one unyielding group or another. You often see a balanced and a fair approach that demands sacrifice, a little sacrifice from everyone, abandoned like an orphan without support and without friends. Often you see paralysis and stagnation and drift. You don't like it, and neither do I. What can we do? First of all, we must face the truth, and then we can change our course. We simply must have faith in each other, faith in our ability to govern ourselves, and faith in the future of this Nation. Restoring that faith and that confidence to America is now the most important task we face. It is a true challenge of this generation of Americans. One of the visitors to Camp David last week put it this way: We've got to stop crying and start sweating, stop talking and start walking, stop cursing and start praying. The strength we need will not come from the White House, but from every house in America. We know the strength of America. We are strong. We can regain our unity. We can regain our confidence. We are the heirs of generations who survived threats much more powerful and awesome than those that challenge us now. Our fathers and mothers were strong men and women who shaped a new society during the Great Depression, who fought world wars, and who carved out a new charter of peace for the world. We ourselves are the same Americans who just 10 years ago put a man on the Moon. We are the generation that dedicated our society to the pursuit of human rights and equality. And we are the generation that will win the war on the energy problem and in that process rebuild the unity and confidence of America." Jimmy Carter: "I know, of course, being President, that government actions and legislation can be very important. That's why I've worked hard to put my campaign promises into law, and I have to admit, with just mixed success. But after listening to the American people I have been reminded again that all the legislation in the world can't fix what's wrong with America. So, I want to speak to you first tonight about a subject even more serious than energy or inflation. I want to talk to you right now about a fundamental threat to American democracy. I do not mean our political and civil liberties. They will endure. And I do not refer to the outward strength of America, a nation that is at peace tonight everywhere in the world, with unmatched economic power and military might. The threat is nearly invisible in ordinary ways. It is a crisis of confidence. It is a crisis that strikes at the very heart and soul and spirit of our national will. We can see this crisis in the growing doubt about the meaning of our own lives and in the loss of a unity of purpose for our Nation. The erosion of our confidence in the future is threatening to destroy the social and the political fabric of America. The confidence that we have always had as a people is not simply some romantic dream or a proverb in a dusty book that we read just on the Fourth of July. It is the idea which founded our Nation and has guided our development as a people. Confidence in the future has supported everything else, public institutions and private enterprise, our own families, and the very Constitution of the United States. Confidence has defined our course and has served as a link between generations. We've always believed in something called progress. We've always had a faith that the days of our children would be better than our own. Our people are losing that faith, not only in government itself but in the ability as citizens to serve as the ultimate rulers and shapers of our democracy. As a people we know our past and we are proud of it. Our progress has been part of the living history of America, even the world. We always believed that we were part of a great movement of humanity itself called democracy, involved in the search for freedom, and that belief has always strengthened us in our purpose. But just as we are losing our confidence in the future, we are also beginning to close the door on our past." Jimmy Carter: "In a nation that was proud of hard work, strong families, close-knit communities, and our faith in God, too many of us now tend to worship self-indulgence and consumption. Human identity is no longer defined by what one does, but by what one owns. But we've discovered that owning things and consuming things does not satisfy our longing for meaning. We've learned that piling up material goods cannot fill the emptiness of lives which have no confidence or purpose. The symptoms of this crisis of the American spirit are all around us. For the first time in the history of our country a majority of our people believe that the next 5 years will be worse than the past 5 years. Two-thirds of our people do not even vote. The productivity of American workers is actually dropping, and the willingness of Americans to save for the future has fallen below that of all other people in the Western world. As you know, there is a growing disrespect for government and for churches and for schools, the news media, and other institutions. This is not a message of happiness or reassurance, but it is the truth and it is a warning. These changes did not happen overnight. They've come upon us gradually over the last generation, years that were filled with shocks and tragedy. We were sure that ours was a nation of the ballot, not the bullet, until the murders of John Kennedy and Robert Kennedy and Martin Luther King, Jr. We were taught that our armies were always invincible and our causes were always just, only to suffer the agony of Vietnam. We respected the Presidency as a place of honor until the shock of Watergate. We remember when the phrase "sound as a dollar" was an expression of absolute dependability, until 10 years of inflation began to shrink our dollar and our savings. We believed that our Nation's resources were limitless until 1973, when we had to face a growing dependence on foreign oil. These wounds are still very deep. They have never been healed." Jimmy Carter: "We are at a turning point in our history. There are two paths to choose. One is a path I've warned about tonight, the path that leads to fragmentation and self-interest. Down that road lies a mistaken idea of freedom, the right to grasp for ourselves some advantage over others. That path would be one of constant conflict between narrow interests ending in chaos and immobility. It is a certain route to failure. All the traditions of our past, all the lessons of our heritage, all the promises of our future point to another path, the path of common purpose and the restoration of American values. That path leads to true freedom for our Nation and ourselves. We can take the first steps down that path as we begin to solve our energy problem. Energy will be the immediate test of our ability to unite this Nation, and it can also be the standard around which we rally. On the battlefield of energy we can win for our Nation a new confidence, and we can seize control again of our common destiny. In little more than two decades we've gone from a position of energy independence to one in which almost half the oil we use comes from foreign countries, at prices that are going through the roof. Our excessive dependence on OPEC has already taken a tremendous toll on our economy and our people. This is the direct cause of the long lines which have made millions of you spend aggravating hours waiting for gasoline. It's a cause of the increased inflation and unemployment that we now face. This intolerable dependence on foreign oil threatens our economic independence and the very security of our Nation. The energy crisis is real. It is worldwide. It is a clear and present danger to our Nation. These are facts and we simply must face them." Jimmy Carter: "Twelve hours from now I will speak again in Kansas City, to expand and to explain further our energy program. Just as the search for solutions to our energy shortages has now led us to a new awareness of our Nation's deeper problems, so our willingness to work for those solutions in energy can strengthen us to attack those deeper problems. I will continue to travel this country, to hear the people of America. You can help me to develop a national agenda for the 1980's. I will listen and I will act. We will act together. These were the promises I made 3 years ago, and I intend to keep them. Little by little we can and we must rebuild our confidence. We can spend until we empty our treasuries, and we may summon all the wonders of science. But we can succeed only if we tap our greatest resources, America's people, America's values, and America's confidence. I have seen the strength of America in the inexhaustible resources of our people. In the days to come, let us renew that strength in the struggle for an energy secure nation. In closing, let me say this: I will do my best, but I will not do it alone. Let your voice be heard. Whenever you have a chance, say something good about our country. With God's help and for the sake of our Nation, it is time for us to join hands in America. Let us commit ourselves together to a rebirth of the American spirit. Working together with our common faith we cannot fail. Thank you and good night." MS President Jimmy Carter sitting at desk, addressing the nation: "Good evening. This is a special night for me. Exactly 3 years ago, on July 15, 1976, I accepted the nomination of my party to run for President of the United States. I promised you a President who is not isolated from the people, who feels your pain, and who shares your dreams and who draws his strength and his wisdom from you. During the past 3 years I've spoken to you on many occasions about national concerns, the energy crisis, reorganizing the Government, our Nation's economy, and issues of war and especially peace. But over those years the subjects of the speeches, the talks, and the press conferences have become increasingly narrow, focused more and more on what the isolated world of Washington thinks is important. Gradually, you've heard more and more about what the Government thinks or what the Government should be doing and less and less about our Nation's hopes, our dreams, and our vision of the future. Ten days ago I had planned to speak to you again about a very important subject, energy. For the fifth time I would have described the urgency of the problem and laid out a series of legislative recommendations to the Congress. But as I was preparing to speak, I began to ask myself the same question that I now know has been troubling many of you. Why have we not been able to get together as a nation to resolve our serious energy problem? It's clear that the true problems of our Nation are much deeper, deeper than gasoline lines or energy shortages, deeper even than inflation or recession. And I realize more than ever that as President I need your help." Jimmy Carter: "So, I decided to reach out and listen to the voices of America. I invited to Camp David people from almost every segment of our society, business and labor, teachers and preachers, Governors, mayors, and private citizens. And then I left Camp David to listen to other Americans, men and women like you. It has been an extraordinary 10 days, and I want to share with you what I've heard. First of all, I got a lot of personal advice. Let me quote a few of the typical comments that I wrote down. This from a southern Governor: Mr. President, you are not leading this Nation, you're just managing the Government. You don't see the people enough any more. Some of your Cabinet members don't seem loyal. There is not enough discipline among your disciples. Don't talk to us about politics or the mechanics of government, but about an understanding of our common good. Mr. President, we're in trouble. Talk to us about blood and sweat and tears. If you lead, Mr. President, we will follow. Many people talked about themselves and about the condition of our Nation. This from a young woman in Pennsylvania: I feel so far from government. I feel like ordinary people are excluded from political power. And this from a young Chicano: Some of us have suffered from recession all our lives. Some people have wasted energy, but others haven't had anything to waste. And this from a religious leader: No material shortage can touch the important things like God's love for us or our love for one another. And I like this one particularly from a black woman who happens to be the mayor of a small Mississippi town: The big-shots are not the only ones who are important. Remember, you can't sell anything on Wall Street unless someone digs it up somewhere else first. This kind of summarized a lot of other statements: Mr. President, we are confronted with a moral and a spiritual crisis. " Jimmy Carter: "We often think of conservation only in terms of sacrifice. In fact, it is the most painless and immediate way of rebuilding our Nation's strength. Every gallon of oil each one of us saves is a new form of production. It gives us more freedom, more confidence, that much more control over our own lives. So, the solution of our energy crisis can also help us to conquer the crisis of the spirit in our country. It can rekindle our sense of unity, our confidence in the future, and give our Nation and all of us individually a new sense of purpose. You know we can do it. We have the natural resources. We have more oil in our shale alone than several Saudi Arabias. We have more coal than any nation on Earth. We have the world's highest level of technology. We have the most skilled work force, with innovative genius, and I firmly believe that we have the national will to win this war. I do not promise you that this struggle for freedom will be easy. I do not promise a quick way out of our Nation's problems, when the truth is that the only way out is an all-out effort. What I do promise you is that I will lead our fight, and I will enforce fairness in our struggle, and I will ensure honesty. And above all, I will act. We can manage the short-term shortages more effectively and we will, but there are no short-term solutions to our long-range problems. There is simply no way to avoid sacrifice." Jimmy Carter: "Point four: I'm asking Congress to mandate, to require as a matter of law, that our Nation's utility companies cut their massive use of oil by 50 percent within the next decade and switch to other fuels, especially coal, our most abundant energy source. Point five: To make absolutely certain that nothing stands in the way of achieving these goals, I will urge Congress to create an energy mobilization board which, like the War Production Board in World War II, will have the responsibility and authority to cut through the redtape, the delays, and the endless roadblocks to completing key energy projects. We will protect our environment. But when this Nation critically needs a refinery or a pipeline, we will build it. Point six: I'm proposing a bold conservation program to involve every State, county, and city and every average American in our energy battle. This effort will permit you to build conservation into your homes and your lives at a cost you can afford. I ask Congress to give me authority for mandatory conservation and for standby gasoline rationing. To further conserve energy, I'm proposing tonight an extra $10 billion over the next decade to strengthen our public transportation systems. And I'm asking you for your good and for your Nation's security to take no unnecessary trips, to use carpools or public transportation whenever you can, to park your car one extra day per week, to obey the speed limit, and to set your thermostats to save fuel. Every act of energy conservation like this is more than just common sense, I tell you it is an act of patriotism. Our Nation must be fair to the poorest among us, so we will increase aid to needy Americans to cope with rising energy prices." Jimmy Carter: "What I have to say to you now about energy is simple and vitally important. Point one: I am tonight setting a clear goal for the energy policy of the United States. Beginning this moment, this Nation will never use more foreign oil than we did in 1977, never. From now on, every new addition to our demand for energy will be met from our own production and our own conservation. The generation-long growth in our dependence on foreign oil will be stopped dead in its tracks right now and then reversed as we move through the 1980's, for I am tonight setting the further goal of cutting our dependence on foreign oil by one-half by the end of the next decade, a saving of over 4 1/2 million barrels of imported oil per day. Point two: To ensure that we meet these targets, I will use my Presidential authority to set import quotas. I'm announcing tonight that for 1979 and 1980, I will forbid the entry into this country of one drop of foreign oil more than these goals allow. These quotas will ensure a reduction in imports even below the ambitious levels we set at the recent Tokyo summit. Point three: To give us energy security, I am asking for the most massive peacetime commitment of funds and resources in our Nation's history to develop America's own alternative sources of fuel, from coal, from oil shale, from plant products for gasohol, from unconventional gas, from the Sun. I propose the creation of an energy security corporation to lead this effort to replace 2 1/2 million barrels of imported oil per day by 1990. The corporation will issue up to $5 billion in energy bonds, and I especially want them to be in small denominations so that average Americans can invest directly in America's energy security. Just as a similar synthetic rubber corporation helped us win World War II, so will we mobilize American determination and ability to win the energy war. Moreover, I will soon submit legislation to Congress calling for the creation of this Nation's first solar bank, which will help us achieve the crucial goal of 20 percent of our energy coming from solar power by the year 2000. These efforts will cost money, a lot of money, and that is why Congress must enact the windfall profits tax without delay. It will be money well spent. Unlike the billions of dollars that we ship to foreign countries to pay for foreign oil, these funds will be paid by Americans to Americans. These funds will go to fight, not to increase, inflation and unemployment." Jimmy Carter: "Several of our discussions were on energy, and I have a notebook full of comments and advice. I'll read just a few. We can't go on consuming 40 percent more energy than we produce. When we import oil we are also importing inflation plus unemployment. We've got to use what we have. The Middle East has only 5 percent of the world's energy, but the United States has 24 percent. And this is one of the most vivid statements: Our neck is stretched over the fence and OPEC has a knife. There will be other cartels and other shortages. American wisdom and courage right now can set a path to follow in the future. This was a good one: Be bold, Mr. President. We may make mistakes, but we are ready to experiment. And this one from a labor leader got to the heart of it: The real issue is freedom. We must deal with the energy problem on a war footing. And the last that I'll read: When we enter the moral equivalent of war, Mr. President, don't issue us BB guns. These 10 days confirmed my belief in the decency and the strength and the wisdom of the American people, but it also bore out some of my longstanding concerns about our Nation's underlying problems." President Jimmy Carter enters a room in the White House for a press conference. 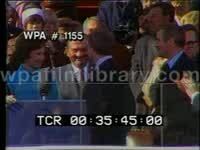 He shakes hands with those standing on stage, former First Lady LADY BIRD JOHNSON among them, then speaks. "Pat said there's no way I can prevent her finishing her speech. [Laughter] (The President had entered the East Room as Secretary of Health, Education, and Welfare Patricia Roberts Harris was speaking.) I understand that you have so many important and significant people here that it took a long time to introduce you all, and I think that's typical of the character of the program that you are here to honor. I'm very grateful to see Lady Bird Johnson here, and Pat Harris, who's done such a good job as a Secretary, and Stu Eizenstat, who has helped to forge a good relationship since I've been in the White House between my administration and the Congress and the people throughout the Nation. I join with you today in confirming a great national commitment, one that has grown in vitality during the last 15 years. This is not always the case. When a wonderful idea is put into practice, it has to have an innate worth and the support of dedicated people to be truly successful. Head Start was a program with high Federal commitment, high objectives, high performance envisioned in it. At the beginning it was called, and I quote, constructive, sensitive, and exciting, and today I think it's accurate to state that it's more constructive, sensitive, and exciting, even than those first early days back in 1965. (applause) It's also well named. Seven and a half million Americans have been given a head start over the life which they would have led, and their direct influence on others who've observed them and others who've learned from them, many now at the adult stage of life, has greatly magnified the influence of those 7 1/2 million. They got a head start in nutrition, in health, in education, in self-confidence, in self-respect, in the esteem of those who've known and loved them. And today we're here to honor the hundreds of thousands of Americans of all kinds who've made this program successful." President Jimmy Carter continues: "Like so many of us here, I have seen the sometimes awful truth of Lyndon Johnson's analysis, in people who've lived around me in the Deep South, people who were deprived and whose lives were blighted by it. My first public job was on a local school board, and I saw among the children that I served, as a farmer, a young businessman, that deprivation which I did not know how to address. It was not only educational but it was emotional, and sometimes it was physical, as well. I saw that deprivation set children back in school before the first day they ever went there, and it held them back through grammar school, through high school, and through their entire lives. And I saw that it affected not just black children but white children, as well. In 1965, when the Head Start program was begun by President Johnson and the Congress, I was heading up an eight county planning and development commission. And as soon as I heard about Head Start, I began to work to implement it where I lived. It was not a popular thing, because it addressed some very sensitive social issues, as well as educational problems. [Laughter] And we finally identified 2,000, about 1,950 young children who qualified. And we finally forced, because of the influence that I had accumulated, 21 school classrooms to be allotted to the program. In Buena Vista, Georgia, black and white children in 1965 sat down in the same library and participated in the program. I guess it was the first integrated classroom in the State, and it was very difficult to get other county school boards to agree to let the program live. Because of that difficulty, I spent a lot of time moving among those 19 or 20 Head Start classrooms. I spent a lot of time sitting on the floor with the children who were participating and talking to them in the same language within which I had been raised. Many of those children had never seen a book, and they had never held a pencil. They had never tied a shoelace. Some didn't know their last name. They had never had a balanced diet for as long as a few days. At the time, they had never had their minds stretched or challenged, and their hearts could have been shriveled in the future had they been continued in a state of existing deprivation. The first time they saw what it could mean to be gratified in intense, young, human desires and to see dreams realized and to hear a voice of a teacher who knew how to teach and who genuinely loved them and to be provided with the practical things that make a day in a Head Start program so exciting and so successful, I think most important of all, they learned, many of them for the first time, that they were important to the world. I came home several times, and my wife would vouch for this, with tears in my eyes as I told her about my day's experience. I was a tough, young, struggling, conservative, south Georgia farmer, but this program touched my life. And since then I've seen literally thousands of not only children but teachers and parents and the community itself involved in a program that has indeed transformed the interrelationship among human beings." President Jimmy Carter continues: "Head Start is a program that works; it's a program that makes poor children healthier; it's a program that improves future test scores in every sense of the word test. It's a program that helps young people grow more mature in the finest sense of the word, makes them grow more self-confident, and lets them grow emotionally and intellectually throughout their lives. And it's a program that lets students make their parents better, as well, (applause) because one thing we often forget is how much education those 5-year-old children brought home to a parent who may not ever have been blessed with the chance to read a good book or to hear good music or to have a good solid diet or to feel their worth among other human beings. So, the children quite often, even 4 or 5 years old, became teachers themselves. I'm determined to keep Head Start working and growing stronger and more effective. Since we've been in office, Stu just gave me the figures, we have increased the allocation of funds 75 percent for Head Start. And I'm determined to keep this growth intact to protect this program, to nurture this program in the future. (applause) We face difficult times in controlling inflation, as you know. I can't tell you that the growth will continue at that rate, but the Head Start will be protected. And I will be asking the Congress to extend the Head Start program for 5 more years (applause) and to retain those features of the program that I have described to you, in a fumbling way, which has made it so successful. It's worked because in one place we have focused educational and physical and social and emotional correction for disadvantaged, young human beings whom we love. It's done that in a comprehensive way, and it's done that in a way that has gotten the community as well as the entire family involved." President Jimmy Carter continues: "I believe we need to prepare ourselves for future challenges, future opportunities, changing lifestyles, perhaps refocusing on target groups to be receiving the benefits of this program in future years. But I think the flexibility of this program to accommodate changing times and changing demands has been one of its innate strengths. It has not been a dormant, frozen, static program. It's been a live program, which has had a good means of feeding back, from the recipient groups themselves and from those running the program on a daily basis, ideas to Washington that can make it better. And this is the kind of thing that we need to nurture in the future. In 1965 there was a panel of experts appointed by President Johnson to assess the need for the program and how it could best be conducted. I've asked Secretary Harris to meet with a similar group in the near future, at the end of these 15 years, to update the problems, the solutions to those problems, the difficult questions, the answers to those questions, potential obstacles in the future, ways to surmount those obstacles, and a means by which an excellent program can be made even stronger and better in the future." President Jimmy Carter continues: "I'd like to leave you today with a little story that kind of illustrates what I've been trying to say the last 18 minutes. It kind of conveys a feeling that has gone into this program and made it so successful. Recently, within the last few years, a senior citizen began to visit a local Head Start program. This gentleman had a special interest in it, because he had been a former teacher himself. As part of his daily routine in retirement years, he would go to the local Head Start program and spend some time with the little children, and he would always carry a pocketful of jellybeans. And each day the children would look forward to seeing him come. They were tiny kids, and most of them didn't know who this gentleman was. And after awhile, they all called him Mr. Jellybean. Today, many of those Head Start children in Stonewall, Texas, have come to learn that that friendly, retired, ex-schoolteacher, Mr. Jellybean, was former President Lyndon Johnson, whose vision and whose compassion had made the Head Start program possible in the first place. Today, it's my great honor to salute not only former President Johnson, Lady Bird Johnson, and Sargent Shriver but all the fine people who've made Head Start so wonderful for the last 15 years and, with your support, which I'm sure we will have, who will carry on a great and well named program, which has become, in my opinion, one of the beautiful things about the United States." 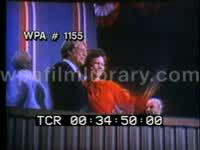 Mr. Carter concludes speech, poses w/ LADY BIRD JOHNSON. Three current participants in the Head Start program walk on stage to present them with buttons to place on their lapels. President Jimmy Carter continues: "I'd like to begin by saying just a few words about a man whose vision and humanity made this program possible and originated the concept. When I made one of my most delightful speeches at the Democratic National Convention in 1976, I had these words to say: Lyndon Johnson did more to advance the cause of human rights in our country than any President in this century. And I'm thankful that that great President, who lived in this house and who worked in this house, addressed human rights in its broadest sense, not just the right to be free of racial discrimination, not just the right in our Nation to have a chance to vote, not just to have a right to seek equality, but to have the right to live a better life. This makes it particularly important that Lady Bird was able to come here to be with us today, because she personifies too, as you know, the essence of what this great man did with those who worked around him. I never had a chance to meet Lyndon Johnson; maybe many of you in this room never had a chance to meet him. But I knew him through his work. I think his life was eloquent in the finest sense of that word. There was an eloquence in advancing social and economic justice; there was an eloquence of clear vision, of simple humanity, and how to translate vision and humanity into action. The success of Head Start, I think, among many other things, but especially Head Start, speaks volumes about what Lyndon Johnson thought about our country's future, because if there ever was a program that had an investment in the future, it was Head Start, future of a nation who had compassion for its people, the particular kind of people who had in the past been neglected or ignored. It was a bold program to translate a vision, again, into the realization of that dream. Lyndon Johnson knew that the cycle of poverty and deprivation starts very early in life, and it had to be attacked early in life. It's between the ages of 3 and 5, really, that a human being begins to understand the worth of his or her individual life and begins to shape a goal of what might be achieved, begins to compare oneself with others and sense opportunities or lack of them in future years. It's in that early stage, maybe even earlier than 3 years old, that dreams are either born and survive or die." Jimmy Carter discussing environmental change. Another major challenge, therefore, is to protect the quality of this world within which we live. The shadows that fail across the future are cast not only by the kinds of weapons we have built, but by the kind of world we will either nourish or neglect. There are real and growing dangers to our simple and most precious possessions: the air we breathe; the water we drink; and the land which sustain us. The rapid depletion of irreplaceable minerals, the erosion of topsoil, the destruction of beauty, the blight of pollution, the demands of increasing billions of people, all combine to create problems which are easy to observe and predict but difficult to resolve. If we do not act, the world of the year 2000 will be much less able to sustain life than it is now. But there is no reason for despair. Acknowledging the physical realities of our planet does not mean a dismal future of endless sacrifice. In fact, acknowledging these realities is the first step in dealing with them. We can meet the resource problems of the world -- water, food, minerals, farmlands, forests, overpopulation, and pollution -- if we tackle them with courage and foresight. I have just been talking about forces of potential destruction that mankind has developed, and how we might control them. It is equally important that we remember the beneficial forces that we have evolved over the ages, and how to hold fast to them. We live in a time of transition, an uneasy era which is likely to endure for the rest of this century. It will be a period of tensions both within nations and between nations -- of competition for scarce resources, of social political and economic stresses and strains. During this period we may be tempted to abandon some of the time-honored principles and commitments which have been proven during the difficult times of past generations. We must never yield to this temptation. Our American values are not luxuries but necessities -- not the salt in our bread but the bread itself. Our common vision of a free and just society is our greatest source of cohesion at home and strength abroad-- greater even than the bounty of our material blessings. President Jimmy Carter speaks from the Oval Office. Good evening. In a few days, I will lay down my official responsibilities in this office to take up once more the only title in our democracy superior to that of president. The title of citizen. Of Vice Walter President Mondale, my cabinet and the hundreds of others who have served with me during the last four years, I wish to say publicly what I have said in private. I thank them for the dedication and competence they have brought to the service of our country. But I owe my deepest thanks to you, the American people because you gave me this extraordinary opportunity to serve. We have faced great challenges together. We know that future problems will also be difficult but I am now more convinced than ever that the United States, better than any other country, can meet successfully whatever the future might bring. These last four years have made me more certain than ever of the inner strength of our country. The unchanging value of our principles and ideals, the stability of our political system and the ingenuity and the decency of our people. Nuclear weapons are an expression of one side of our human character. But there is another side. The same rocket technology that delivers nuclear warheads has also taken us peacefully into space. From that perspective, we see our Earth as it really is -- a small and fragile and beautiful blue globe, the only home we have. We see no barriers of race or religion or country. We see the essential unity of our species and our planet; and with faith and common sense, that bright vision will ultimately prevail. Jimmy Carter Today, as people have become ever more doubtful of the ability of the government to deal with our problems. We are increasingly drawn to single-issue groups and special interest organizations to ensure that whatever else happens our own personal views and our own private interests are protected. This is a disturbing factor in American political life. It tends to distort our purposes because the national interest is not always the sum of all our single or special interests. We are all Americans together and we must not forget that the common good is our common interest and our individual responsibility. Jimmy Carter Today we are asking our political system to do things of which the founding fathers never dreamed. The government they designed for a few hundred thousand people now serves a nation of almost 230 million people. Their small coastal republic now spans beyond a continent, and we now have the responsibility to help lead much of the world through difficult times to a secure and prosperous future. National weakness, real or perceived, can tempt aggression and thus cause war. That's why the United States can never neglect its military strength. We must and we will remain strong. But with equal determination, the United States and all countries must find ways to control and to reduce the horrifying danger that is posed by the enormous world's stockpiles of nuclear arms. Jimmy Carter on Nuclear Destruction. It's now been 35 years since the first atomic bomb fell on Hiroshima. The great majority of the world's people cannot remember a time when the nuclear shadow did not hang over the earth. Our minds have adjusted to it, as after a time our eyes adjust to the dark. Yet the risk of a nuclear conflagration has not lessened. It has not happened yet, thank God, but that can give us little comfort, for it only has to happen once. The danger is becoming greater. As the arsenals of the superpowers grow in size and sophistication and as other governments acquire these weapons. It may only be a matter of time before madness, desperation, greed or miscalculation lets lose this terrible force. In an all-out nuclear war, more destructive power than in all of World War II would be unleashed every second during the long afternoon it would take for all the missiles and bombs to fall. A World War II every second; more people killed in the first few hours than all the wars of history put together. The survivors, if any, would live in despair amid the poisoned ruins of a civilization that had committed suicide. I understand after four years in office, as few others can, how formidable is the task the new president-elect is about to undertake. To the very limits of conscience and conviction, I pledge to support him in that task. I wish him success, and Godspeed. I know from experience that presidents have to face major issues that are controversial, broad in scope, and which do not arouse the natural support of a political majority. Remember these words: We hold these truths to be self-evident, that all men are created equal; that they are endowed by their creator with certain inalienable rights; that among these are life liberty and the pursuit of happiness." This vision still grips the imagination of the world. But we know that democracy is always an unfinished creation. Each generation must renew its foundations. Each generation must rediscover the meaning of this hallowed vision in the light of its own modern challenges. For this generation, ours, life is nuclear survival; liberty is human rights; the pursuit of happiness is a planet whose resources are devoted to the physical and spiritual nourishment of its inhabitants. During the next few days I will work hard to make sure that the transition from myself to the next president is a good one so that the American people are served well. And I will continue as I have the last 14 months to work hard and to pray for the lives and the well-being of the American hostages held in Iran. I can't predict yet what will happen, but I hope you will join me in my constant prayer for their freedom. As I return home to the South where I was born and raised, I am looking forward to the opportunity to reflect and further to assess, I hope with accuracy, the circumstances of our times. I intend to give our new president my support, and I intend to work as a citizen, as I have worked in this office as president, for the values this nation was founded to secure. Jimmy Carter Tonight I would like first to say a few words about this most special office: the presidency of the United States. This is at once the most powerful office in the world and among the most severely constrained by law and custom. The president is given a broad responsibility to lead; but cannot do so without the support and consent of the people expressed formally through the Congress and informally in many ways through a whole range of public and private institutions. This is as it should be. Within our system of government every American has a right and duty to help shape the future course of the United States. Thoughtful criticism and close scrutiny of all government officials by the press and the public are an important part of our Democratic society. Now as in our past, only the understanding and involvement of the people through full and open debate can help to avoid serious mistakes and assure the continued dignity and safety of the nation. America did not invent human rights. In a very real sense, it is the other way round. Human rights invented America. Ours was the first nation in the history of the world to be founded explicitly on such an idea. Our social and political progress has been based on one fundamental principle -- the value and importance of the individual. The fundamental force that unites us is not kinship or place of origin or religious preference. The love of liberty is a common blood that flows in our American veins. Carter on Human Rights. One of those constructive forces is enhancement of individual human freedoms through the strengthening of democracy, and the fight against deprivation, torture, terrorism and the persecution of people throughout the world. The struggle for human rights overrides all differences of color, nation or language. Those who hunger for freedom, who thirst for human dignity, and who suffer for the sake of justice -- they are the patriots of this cause. I believe with all my heart that America must always stand for these basic human rights -- at home and abroad. That is both our history and our destiny. Jimmy Carter from the Oval Office. Because of the fragmented pressures of special interests, it's very important that the office of the president be a strong one, and that its constitutional authority be preserved. The president is the only elected official charged with the primary responsibility of representing all the people. In the moments of decision, after the different and conflicting views have been aired, it is the president who then must speak to the nation and for the nation. The battle for human rights, at home and abroad, is far from over. We should never be surprised nor discouraged because the impact of our efforts has had, and will always have, varied results. Rather, we should take pride that the ideals which gave birth to our nation still inspire the hopes of oppressed people around the world. We have no cause for self-righteousness or complacency. But we have every reason to persevere, both within our own country and beyond our borders. If we are to serve as a beacon for human rights, we must continue to perfect here at home the rights and values which we espouse around the world: A decent education for our children, adequate medical care for all Americans, an end to discrimination against minorities and women, a job for all those able to work, and freedom from injustice and religious intolerance.